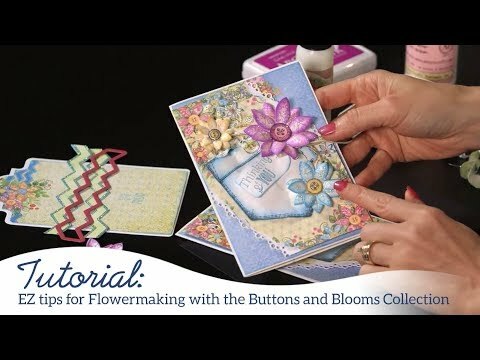 For more tips on creating with the Buttons and Blooms collection, watch the tutorial at https://youtu.be/WpR2XrSH0U0. Instructions: Click here to view a larger photo of this project. 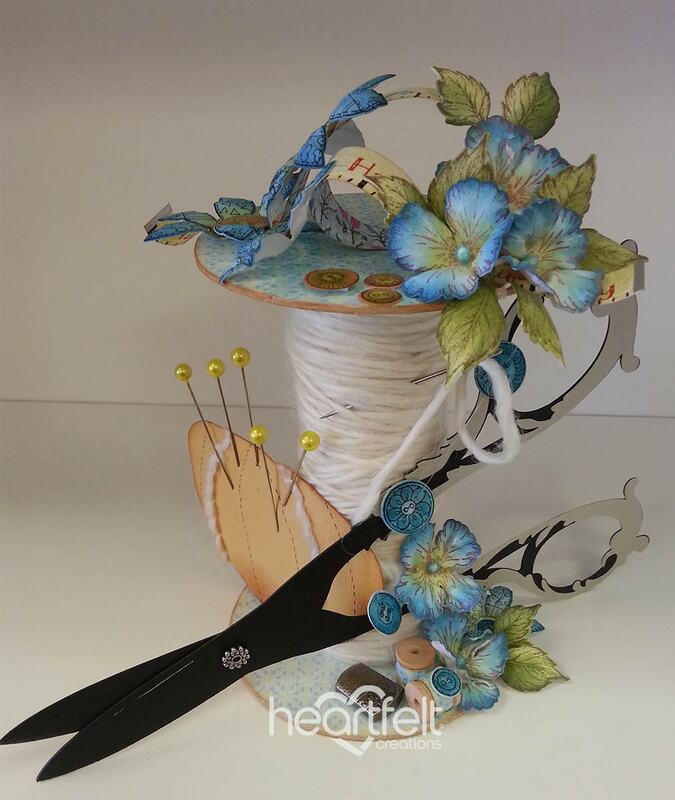 Take your black, silver and ochre cardstock and cut out this SVG file of the Scissor and pin cushion. Enlarge the file to 125% follow the instructions on how to put it together. Take 2 paper coasters and cover them with paper from the paper collection and ink the edges, take a piece of the empty roll and cover this also with the design paper then glue it in between the 2 coasters, now you have a spool. Take the wool and run it around the spool and put a needle on the end and stick this as a decoration in the wool. Take the Scissor and glue this against the spool. Put some wool in the holes of the pin cushion as if it is stitched. Make some stripes on it using a fine black marker, now you can stick some pins in it and cover the back with some white cardstock. Glue the pincushion next to the Scissor on the spool. Take a strip of the design paper and make a tape measure with it using a silver and black marker, and glue this with a twirl on the top of the spool. Take a piece of clear wire and run this from the top through the scissors to the bottom, here you can glue some buttons on. Using Rhubarb Stalk stamp the Oakberry Blossoms on white cardstock and cut them out with the coordinating dies, then color them with New Sprout in the middle and on the ends with Teal Zeal on the petals. Put them up side down in the 3D mold and mist them very lightly with water, you can put 3 layers in if you want. Put the top on the mold and run it through the machine. 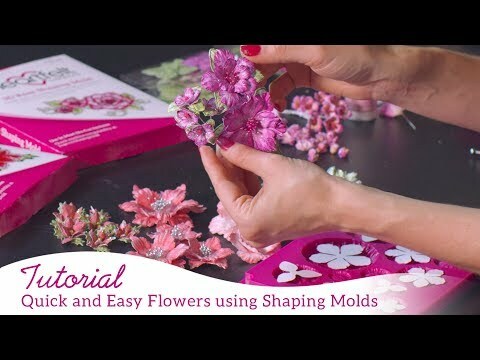 Glue 2 flowers on top of each other, make a hole in the middle and pull the stamens through. Then glue them on top and bottom of the spool. Stamp using Tuxedo Black the Buttons and Blooms stamps on white cardstock, color them with the Buttercup, Teal Zeal and cut them out with the coordinating dies, you can glue them around the flowers on top and bottom of the spool, now put 3D Crystal lacquer on the flowers and let them dry.